Scroll down for highway directions and scroll down even more for a photo guide! 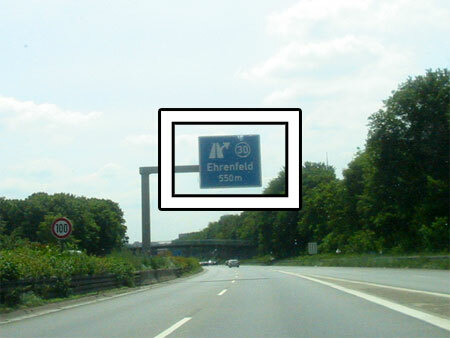 If you already are on the A57, coming from direction Krefeld or Düsseldorf, just stay on this motorway and leave it on exit #30 (Köln Ehrenfeld). From there on, follow the photo-guide below. If you are coming from the A3 (from direction Oberhausen for example) get on the A1 at "Kreuz Leverkusen" into direction "Euskirchen". You will quickly get to "Kreuz Köln-Nord" where you change onto the A57 direction "Zentrum". 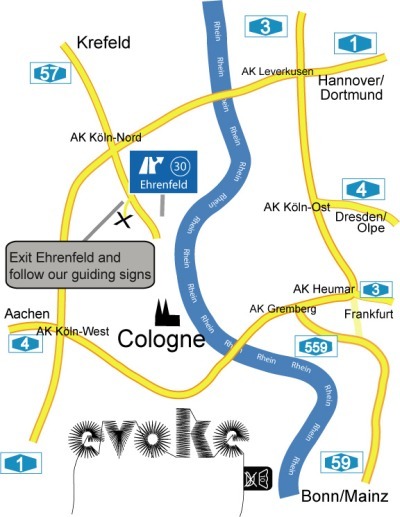 Stay on the A57 until exit #30 (Köln Ehrenfeld) from whereon you follow our photo guide below. 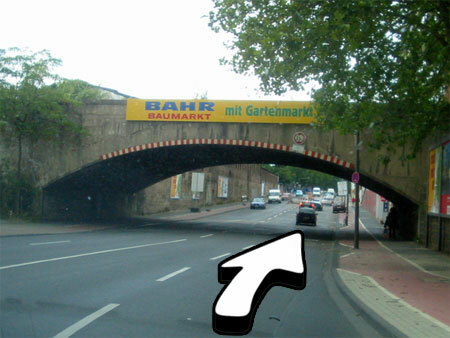 If you are approaching Cologne coming from the east, coming from Dortmund for example, you most likely will be on the A1. Change to the A57 at "Kreuz Köln-Nord" driving to "Zentrum". 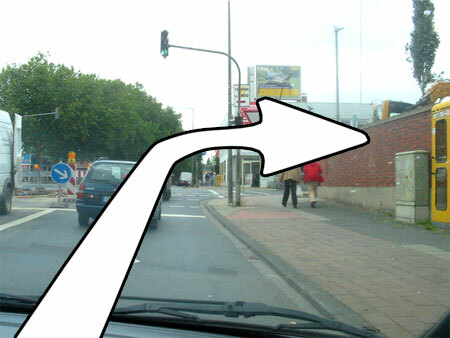 Stay on that motorway until you reach exit #30 (Köln Ehrenfeld) and follow the photo guide from there. From the A4, from direction "Olpe", change onto the A3 to "Oberhausen" at "Kreuz Köln-Ost" then change onto A1 direction "Euskirchen" at "Kreuz Leverkusen" until you can finally change to the A57 at "Kreuz Köln-Nord". Stay here until you reach exit #30 (Köln Ehrenfeld). Follow our photo guide from thereon. If you are alread on the A1, it's easy. Just head over to the A57 at "Kreuz Köln-Nord" into direction "Zentrum" and exit that motorway on exit #30 (Köln Ehrenfeld). Follow the photo guide from there. 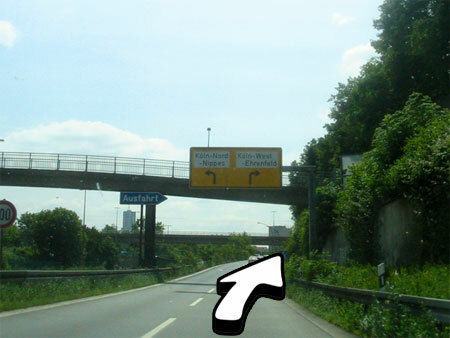 If you come from Bonn via the A59, change onto the A4 to "Aachen" at "Kreuz Köln-Süd" to go ahead to "Kreuz Köln-West" where you change to the A1 (direction "Dortmund"), then you reach "Kreuz Köln-Nord" where you switch motorways to the A57. 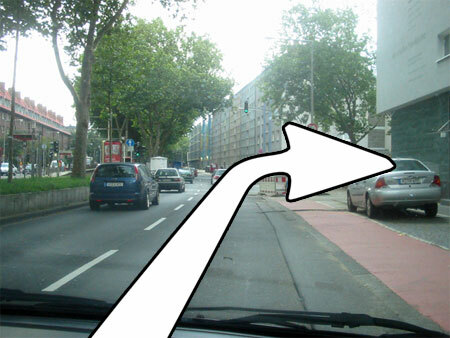 Stay on this street until exit #30 (Köln Ehrenfeld) and follow our photo guide from there. Coming from direction Aachen? Easy! Change onto the A1 (direction "Dortmund") and stay there until you reach "Kreuz Köln-Nord" where you switch over to A57 to "Zentrum". Stay on that motorway until exit #30 comes along, leave the A57 there and follow the photo guide then. For those of you who would like to have all the travelling information gathered in once place: we now have everything in Google Maps. How to find to Evoke. For the by far easiest route, you have to change onto motorway A57 in direction Köln at interchange Köln Nord. After going on Parkkgürtel for a while (passing a postoffice, going under a train-bridge and seeing a Burger King on the right side) turn right into Weinsbergstraße. Go through yet another train-bridge and the next traffic light, turn right into Oskar-Jäger-Straße. 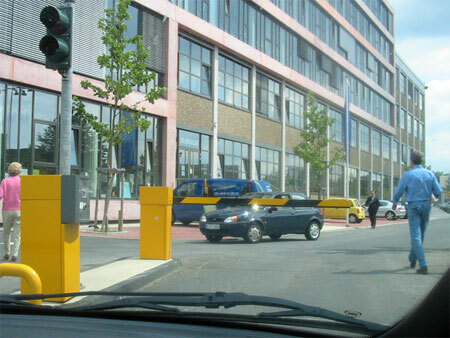 The car park is located after some hundred metres on the right side, look for those nice yellow bars. The actual location is on the left side behind that front of glass-covered buildings, you should be easily abled to find us by the noise. Simply get a parking ticket. You will have to pay when leaving the parking ground. 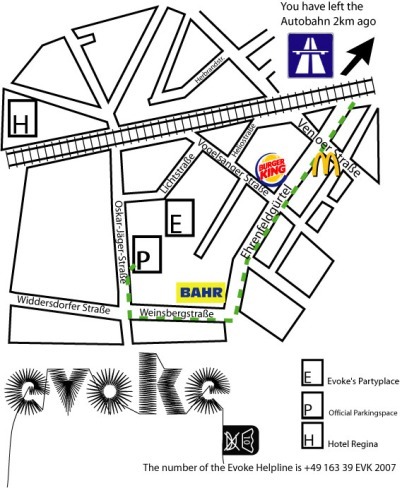 Evoke visitors will get special tickets for 3 Eur (only available at the info desk). All important information on evoke will be announced through our mailinglist. Simply subscribe by entering your email in the field below.